On the challenge of innovating in healthcare and why we invested in MyTomorrows, a platform providing access to possibly life-saving, development stage drugs and treatments. Today we announced our investment in MyTomorrows, a platform which provides very sick patients access to drugs and treatments at trial stage that could, in theory, hugely improve or even save their lives. This is a simple description of a truly radical platform ( you should read more about them here). This is a business which bucks almost every trend that investors, and the tech world generally, look for in a start-up, and at the same time is amongst the most compelling visions I have ever seen. Another investment in healthtech should come as no surprise, as 2014 had been a bumper year. However the challenge for MyTomorrows is that for most investors, this is the wrong type of healthtech. In truth most technical talent and investment goes into consumer software that aims to change people’s behaviour before they are ill (or in most cases, when they are already very healthy) rather than in the clinical space. The reasoning here is simple, the market for software encouraging small behavioural health improvements is global, easy to explain to users and relatively scaleable. Also, they mostly focus on issues which are easier to understand for the people that make most investment decisions and build most tech companies, who are (broadly) well off, educated, young and healthy. This is no bad thing. Small behavioural changes will have a huge impact on improving lives across the world. But this is not enough, and the global systems that help the most vulnerable are in dire need of improvement in both cost and efficiency as well. 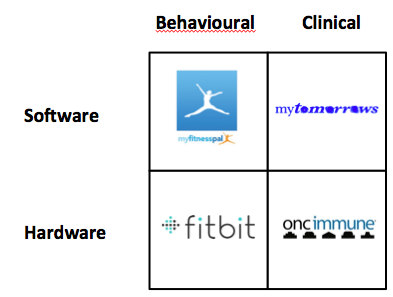 Compared to building behavioural software, building anything in clinical medical practice is cripplingly difficult. Imagine trying to launch a company in this space. It is highly regulated. It varies radically across geographies. The end consumer is not the purchaser. It almost always involves Government. There can be no minimum viable product, it must work from the start. An error can mean someone dies. In my previous career in the charity world, this would have been hard to give a grant to, yet alone invest capital. 1)Insight: Understanding complex industries takes time. We look for many things in a founder, but key is an insight that no-one else has grasped and most people disagree with. Entrepreneurial minds from any background can have insights into how the world is changing ( i.e the impact of a connected world on bookshops ) but those insights are far rarer in complex industries without years, and years, of experience. The founder of MyTomorrows, Ronald Brus is a seasoned and successful entrepreneur with a professional and personal story that changes the way we thought about the entire pharmaceuticals ecosystem. This wasn’t an insight he had overnight, and it’s unlikely anyone without this experience could execute in the same way. 2) Mission: MyTomorrows is not a group of smart people working together, it’s a team on a mission. On walking into their office in Amsterdam, the first thing you see is a mission statement that covers the entire company’s goals and conduct. Most of their team have left high paying careers and comforts behind. Their developers are not looking for the highest pay, they are looking to have the biggest impact. A team so dedicated is worthy of any investor’s time. 3) Need: No matter how entrenched the relationship between pharmaceutical and regulatory bodies in healthcare is today, change will happen. The rules that have governed them for 50 years will give in to the mounting evidence that the relationship is no longer fit for purpose, and in some cases holds up the development and deployment of treatments that can save lives. While there is a mountain to climb, we felt there was enough evidence to suggest now is the time it might happen. The challenge for us is that the risks of supporting this business and their vision goes beyond capital. If they are successful, there will be headlines that say MyTomorrows is saving lives, changing an entire industry and reducing the costs of developing and accessing new drugs. But they must do this while maintaing the highest possible ethical standards. We didn’t make this decision lightly. However, if we are going to attempt to tackle some of the biggest problems facing society, it will involve risks, and the reward for us all of MyTomorrows and other platforms improving clincial care succeeding is one we felt worthwhile. We hope you agree.